During our search for the right hen house, we were invited to the home of Dr. D.S. 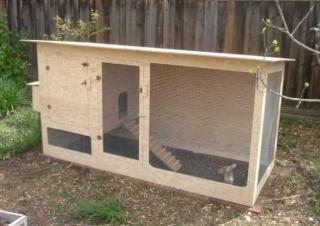 Smith of Hillsborough, California to see the coop he had built and the chickens living in it. The moment my wife and I saw his coop, we knew immediately this was the coop for us. With a footprint of 36 inches x 90 inches, it was compact enough to fit nicely in our small, urban backyard, yet was very functional and large enough for the 3 hens we were planning on. The material list and construction are simple. We especially liked the efficient design that uses full sheets of plywood, with most of the cutout areas utilized for internal walls, floor, nest box and ramp, resulting in very little waste. 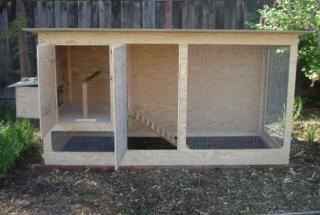 Using all new materials, the henhouse cost about $200 to build, but could cost a lot less with salvaged plywood, etc. Dr. Smith gave me the basic instructions and schematic drawings, but I found the plans rather difficult to follow, despite having a lot of experience in building things. So I decided to use my drafting skills to create more detailed drawings and step-by-step instructions so that even someone who has never built anything before would be able to build this henhouse. I also made several small modifications to improve the original design. It would have been helpful if step-by-step narrative and photos had been included in the article. This seems easy to build and if one wants to pay for instructions, then the link is provided. As far as a helpful article outlining plans, how to pictures, dimensions and drawing of a coop build, this isn't it. Perhaps a few modifications would make this more usable. Plywood exposed to the elements degrades quickly. Are there vents? That is a very nice coop! Does any one have plans that I can purchase? 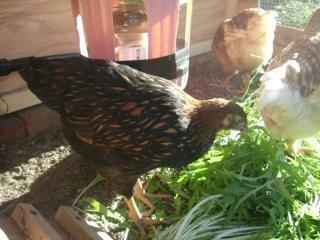 We built this coop and our chicks are loving it. I added some perches in the fenced in area so they had to option to roost outside as well. Great plans that were easy to follow and build.